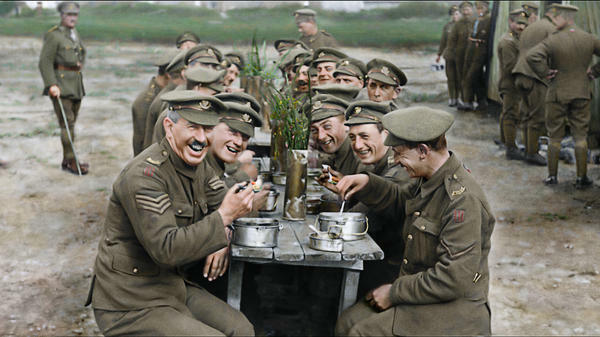 Peter Jackson restores archival footage of British soldiers enjoying a meal in the documentary They Shall Not Grow Old. 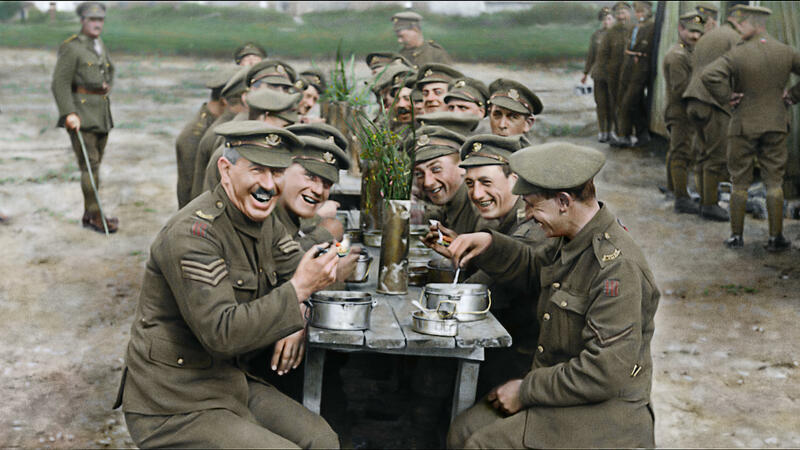 In the closing moments of They Shall Not Grow Old, Peter Jackson's impressionistic documentary — no dates, no title cards, no omniscient narrator — about the foot soldier's experience of the sadly misnamed War to End All Wars, we hear one veteran recall that upon their return to England their wartime experience "had no conversational value at all." Another says, "My father would argue points of fact about things he couldn't possibly have known about, because he wasn't there." A third concludes, "History will decide in the end that it was not worthwhile." These observations echo against those heard 90 minutes earlier, when a few recalled their departure for the front as a sober matter of duty ("We were professionals and it was a job of work"), but many more cited jovial spirits and a lust for adventure ("It was a great big game to be enjoyed"). These voices were recorded in the 1960s, when the BBC interviewed around 250 veterans of the the first World War, as they were still hale enough to speak of their experiences circa 1914-18 with clarity and authority. They were a self-selecting group, the subset of their shelled, gassed, frozen, starved and machine-gunned generation of men most suited to bear the horrific psychological costs of what they witnessed in a war that history has indeed shown to have been particularly cruel and pointless. All of the film's imagery, meanwhile, is sourced from documentary footage from the archive of the Imperial War Museum in London, which commissioned Jackson to make the movie, with the proviso he abstain from using any new footage or archival material from other sources. The director has said that despite being permitted to use only British material, he intends the film to reflect "the human experience" of the war. Certainly this would make an exceedingly poor propaganda film. Jackson's team digitally restored the footage, originally captured by hand-cranking camera operators who were sometimes under fire, and then converted a portion of it into color and 3D. Jackson's technological zeal has sometimes scrambled his artistic judgment — those high-frame-rate presentations of his crummy Hobbit movies just made expensive productions look cheap — but here the results are astonishing, all but erasing the barrier of time that often keeps us at an emotional remove in documentaries about persons long dead. The digital tools summon empathy, not spectacle. Jackson keeps the early section of the film, about the soldiers' training, in square-framed 2D monochrome, delaying the 3D color for their arrival on the battlefield. He has also manufactured a soundtrack for this silent footage, hiring forensic lip-readers to interpret the subjects' speech and casting regionally-appropriate actors to record it. Unlike, say, the way Christopher Nolan used his artistry to conjure a visceral, intentionally disorienting facsimile of combat in Dunkirk, Jackson is resurrecting the dead in more prosaic terms, revealing their lopsided smiles, their prematurely aged faces, their exhausted body language. In its depiction of combat, the movie is powerful but never prurient, cutting between slow-motion shots of young men mugging and clowning and brief, awful still frames of their mangled corpses, flesh rotting away, skulls exploded like eggshells. Over these images, men speak of becoming inured to the "musty, decaying smell." Nothing in the film will refute the familiar notion that technological progress, if that's the right word — and World War I saw the introduction of a variety of particularly nightmarish weapons — has done little to alter the daily existential privation of those who fight, who retain little mastery over their own fates. But as an work of ethical, empathetic exhumation, They Shall Not Grow Old is a model.